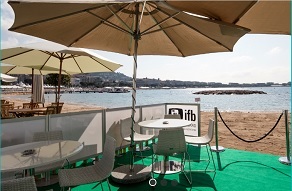 The Irish Pavilion at Cannes Film Festival. Screen Ireland has announced that registration for the Irish Pavilion at the 2019 Cannes Film Festival is now open. Please note that registration for the Irish Pavilion at the Cannes Film Festival is open to Irish production companies and personnel actively working in the Irish film industry only. The Irish Pavilion is located at No. 131, in the International Village. Online registration will close on Thursday 18 April 2019 at 5 pm. IMPORTANT: Please note that membership of the Irish Pavilion is not market or festival accreditation. These must be obtained through the Festival de Cannes and Marche du Film's official websites. Screening or Selling at Cannes? If you have a Screen Ireland-supported film or co-production screening or selling in the market, please let the Screen Ireland know so that they can list the details in their marketing materials. You can inform us of films screening and/or selling by filling out the online form. The 2019 Cannes Film Festival runs from Thursday, May 23rd to Saturday, May 25th in Cannes, France.